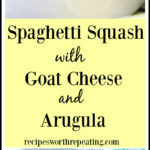 Creamy and slightly peppery, this Spaghetti Squash with Goat Cheese and Arugula is a healthier option for pasta night. A little lemon juice adds tart flavour to the light, tangy sauce. 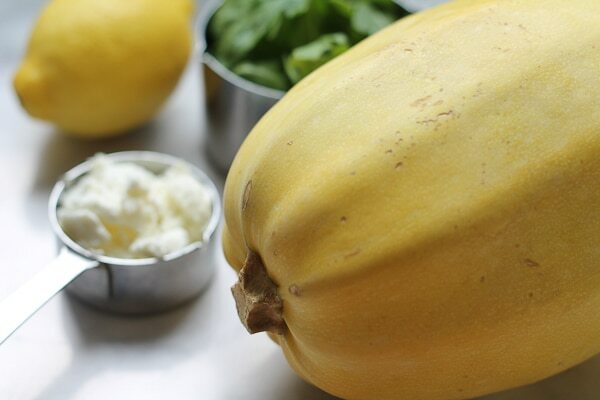 This recipe for spaghetti squash with goat cheese and arugula lets you have your cake and eat it too! Or in this case, have your pasta and eat it too. 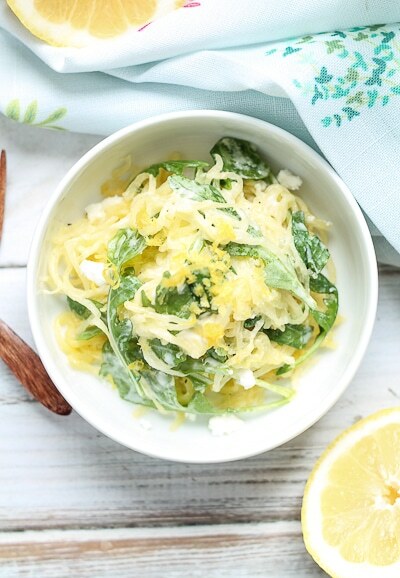 😉 Using Spaghetti Squash as an alternative to wheat pasta is a fabulous way to sneak more veggies into your meal! 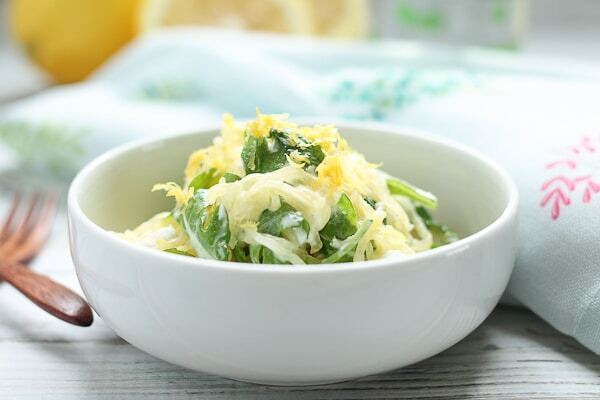 This light and delicious dish is great as a side or as a vegetarian option. 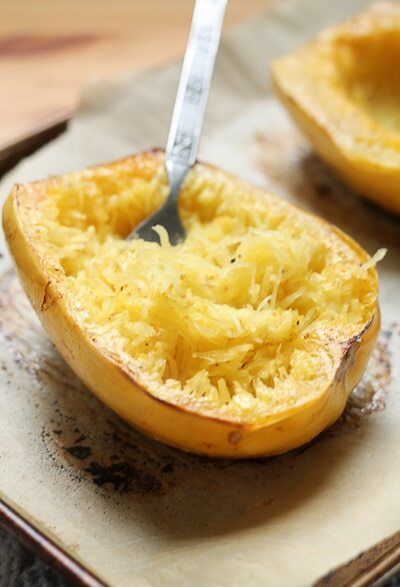 Besides being low calorie, which is always a good thing, Spaghetti Squash is packed with awesome nutrition. 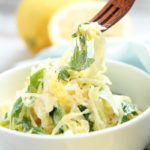 Another reason is that the flavour of spaghetti squash, similar to pasta, really takes on the flavour of your sauce/toppings. You can spice it up Mexican style or get all creamy Alfredo. You decide! First thing to do is get your squash going. I like to roast it in the oven. You’re probably asking yourself how long you should roast your spaghetti squash in the oven and how do I make it look like spaghetti? Learn how –> here! That’s it! SIMPLE ingredients! Oh, and some hot water, but does that even count? 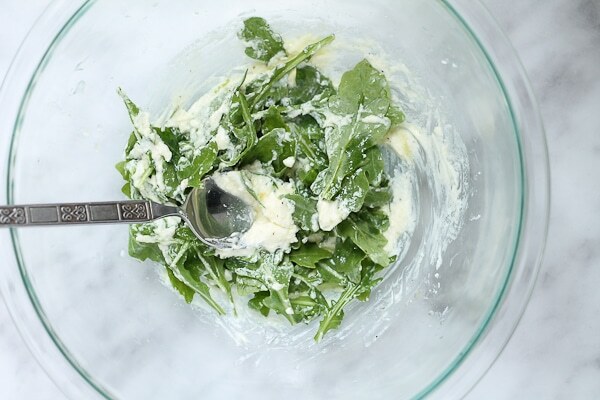 Mix together the goat cheese with fresh lemon juice, add the arugula and wilt it down with a bit of boiling water. See. I told you it was easy. What do you Serve with this dish? Once the squash is roasted and shredded, portion it out and toss in your sauce. You may want to add some protein like chicken or turkey or even lentils or chickpeas. I like to send the man of the house out for a rotisserie chicken and I whip this dish up in the meantime. It tastes FANTASTIC with a nice roasted breast. I’ll sneak in some more crumbled goat cheese, while I’m at it. Top things off with a fresh tossed salad (this homemade classic balsamic dressing is my fave) and you have an impressive meal with a meager amount of effort. I hope you found this blog post and these SIMPLE step-by-step instructions helpful! If you’ve tried this or any other recipe on the blog, then don’t forget to rate the recipe and let me know how it turned out in the comments below! I love hearing from you! You can also sign up for my newsletter and FOLLOW ME on FACEBOOK, TWITTER, INSTAGRAM and PINTEREST to see more delicious food I’m creating! Meanwhile, in a large bowl, stir together the oil, lemon juice, sprinkle of sea salt and lots of fresh pepper. Add in 1/4 cup of the goat cheese, stir then add in the arugula. Spoon 2-3 tablespoons boiling water over the greens and stir again. 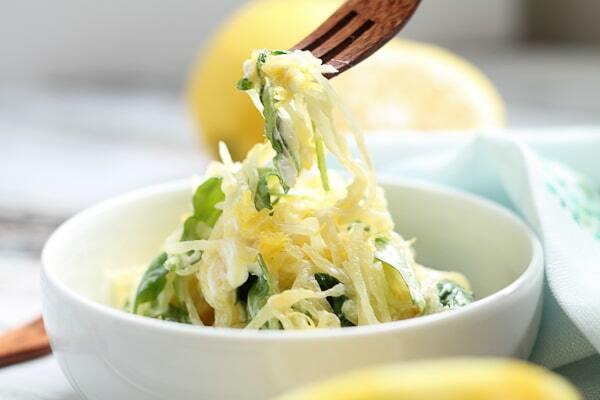 Add the roasted and shredded spaghetti squash to the bowl with the sauce and arugula and toss well. Crumble the remaining 1/4 cup of goat cheese over the top and sprinkle with lemon zest. Sharon is the creator of The Honour System, a real foods centered recipe website that features easy to make meals and snacks. Her motto is "Treat yourself but don't cheat yourself". This looks so delicious and simple! Perfect for a busy weeknight dinner. Can’t wait to try it! That sounds just right! 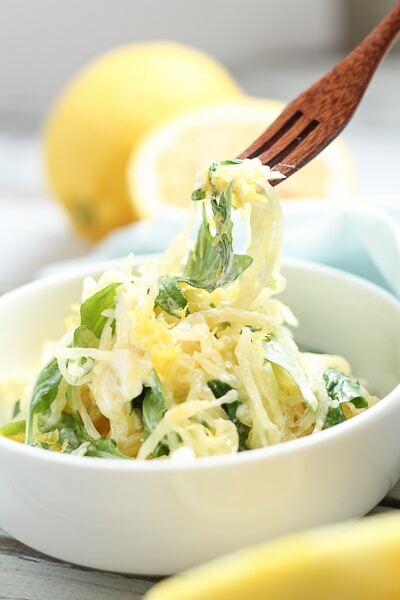 I enjoy spaghetti squash for itself, and dislike drowning it in heavy pasta sauces – but this is light and flavorful without being overwhelming! How lovely.